Four years ago, ISIS militants were sweeping through Iraq, completely decimating all that was in their path, sparing no one. Christians in the Ninevah Plains fled for their lives, some making it to other countries, where they would live for years, others not making it safely. But now, after four years, the 140,000 Christians that lived in the Ninevah Plains are finally returning to their homes. The Knights of Columbus, the largest Catholic fraternal organization in the world, has been working to aid persecuted Christians in the Middle East since the mass purge of Christians from the Ninevah Plains first started taking place. “The program was to eliminate the population and to also eliminate the historical memory — to get the people who lived there out of there,” Andrew Walther of the Knights of Columbus stated. Walther pointed out that not only were Christians displaced from their homes, but their homes were also destroyed — rather quickly, he noted. “This is why they blew up Roman ruins in Palmyra. This is why they blew up the tomb of Jonah. This is why they had a systematic destruction of Christian cemeteries, of Christian churches, and the desecration of Christian graves,” Walther stated. The Nineveh Plains hold much significance for Middle Eastern Christians, and for over 2,000 years, they were home to Assyrian Christians, until ISIS drove them out. ISIS dominated the Ninevah Plains for the next two years, destroying everything they could, including over 13,00 homes and 263 church buildings. “[ISIS’ goal was to] also blow up monuments, to blow up churches, to blow up things that indicated a religious belief that was at odds or just different from ISIS,” Walther added. Four years after the original invasion, the terror group has finally been driven out of the region, but the rebuilding process has only begun. “It’s sort of a town by town basis, some towns have been sort of ethnically cleansed and resettled, other towns are still armed camps and war zones where the original population can’t move back in,” said Walther, who has traveled extensively across Iraq. “Some of the towns still have problems with unexploded ordinance, with mines, with things that make it impossible to move back,” he added. Even though the destruction is immense and the task daunting, many Christians are finding their way back to their homes with the help of groups like the Knights of Columbus. They began their involvement in 2014, helping families return to their homes in Karamels, a small town in the plains. “This was a town that had hundreds of families, all of whom had been forcibly displaced by ISIS, and when the town was liberated, it was in a terrible state,” Walther said. “The Knights of Columbus were able to put in about $2 million to move hundreds of families back home, to help them repair their homes and [to help them] get on with their lives, to pick up the pieces, and to help preserve the multicultural pluralism that has existed in the Christian communities in Iraq for well over a thousand years,” he added. On August 7, people in Karamles threw an event in remembrance of their exodus out of Nineveh, and now, in celebration of their return. Father Salar Kajo has been instrumental in rebuilding villages in the Nineveh Plains, working with the Nineveh Reconstruction Committee (NRC). The NRC has already rebuilt nine different villages, allowing families to start to settle back into their lives before ISIS took over. 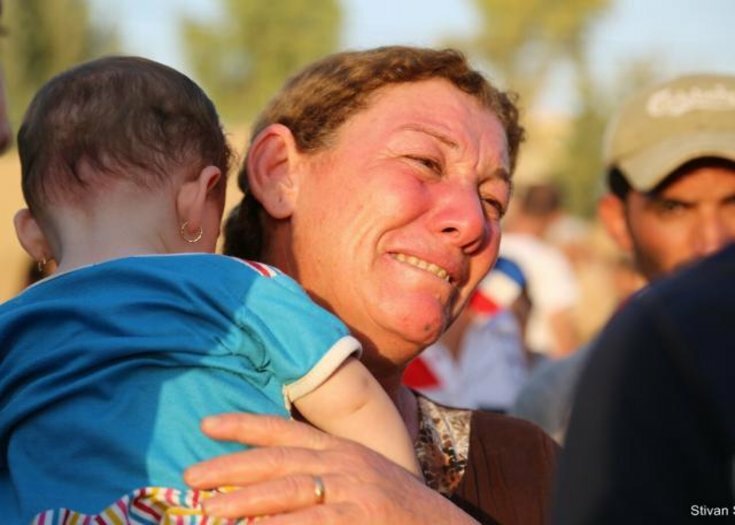 The NRC estimates that around 8,815 Iraqi Christian families have returned to the Nineveh Plains since ISIS was defeated. Many of the Christian groups that are in Iraq are not just helping fellow Christians but people of all backgrounds. “We’ve got medical clinics that assist the needs of the Yazidi, Christian and Muslim populations,” Walther told CBN News. “We have housing that we’ve helped to build for some of the displaced communities, we have also a substantial amount of money that we’ve put into food aid for the Christian community,” he added. The rebuilding won’t be an easy or inexpensive task. It has been estimated that it will cost around $200 million to rebuild the homes, churches, and public buildings. Many non-profits have already spent large amounts of money in the area trying to get people back into their homes safely. “We have done about $20 million of work there since 2014,” Walther stated. Even though a majority of ISIS militants have been driven out of Iraq, there are still fighters all over Iraq and Syria totaling around 20,000 to 30,000. Even though a majority of ISIS fighters are gone, there is still work to be done. Walther also mentioned that Christians that are returning to their homes in the Nineveh Plains are ready to move on from what transpired. “Something that the Christians there tell me repeatedly is that forgiveness is a big element of this,” Walther told CBN. “The idea that the Christian community can forgive what was done to them and to help be a sort of leaven as a result of that, is something they take very seriously,” he said. Father Salar Kajo from the NRC said the same thing — that because of Jesus Christ, the people of the plains will be able to forgive. “This faith also makes it possible for them to truly live this forgiveness,” he added. This story is a story of a people’s homecoming, after being exiled for so many years, being forced to barely survive in foreign lands, while ISIS swept through their towns and villages, destroying everything in their path. Yet, the same people who were forced out of their homes are the same people who are returning with forgiveness in their hearts. They’ve seen their friends killed, relatives driven out of their homes forcibly, yet they are coming to a place where they are ready to forgive the evil people who did this. The Iraqi Christians are taking their faith and their relationship with Christ seriously — and we can learn from their obedience and commitment to living how Christ lived. Pray for the Iraqi people as they return home to rebuild their lives and as they strive to forgive their oppressors.